At Napier, we are a team of individuals who often jump at the chance for a challenge; and with Christmas fast approaching we decided to create a challenge with a twist, that would not only showcase our skills but also make sure we do our part and donate to charity. Email marketing is an essential part of any marketers B2B strategy, with emails being the key way marketers make contact with their audience. At Napier, we are constantly testing out our own email designs, or helping our clients design and deploy their emails. We understand that every marketer is different, and they often have their own preferences when it comes to emails and their layout. In light of this, we thought it would be interesting to run a competition, inviting professionals in the B2B Tech industry to decide which email design out of a choice of 3 they preferred. With the challenge set, the next big step was deciding on the focus of these emails. 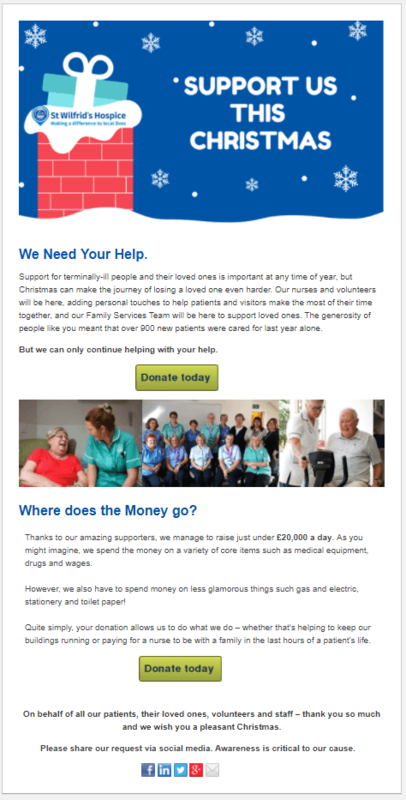 We decided to take a unique direction, and test our skills by creating email designs for a local charity. St Wilfrid’s Hospice was an obvious decision, a local charity in Chichester who care and support people who are in the last phase of their life. As an agency, we also decided to do our part, donating to St Wilfrid’s as a thank you for letting us use their brand and promote their message. 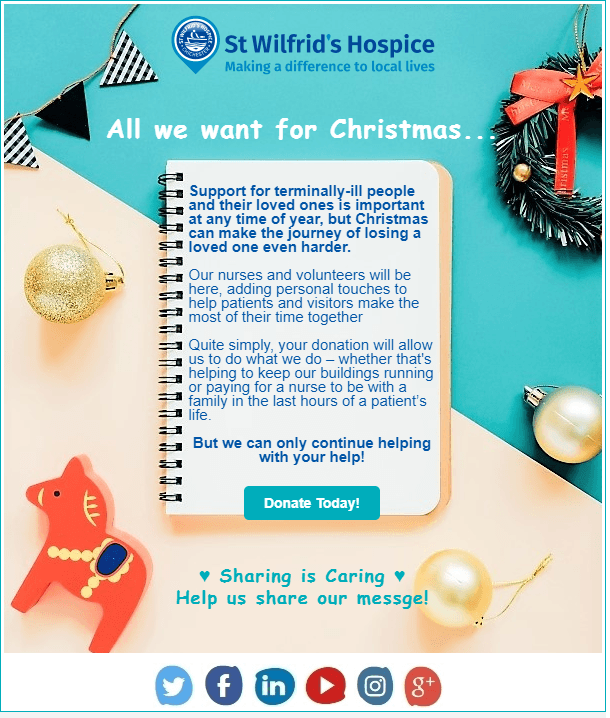 Napier’s’ very own Fiona Challen, Emily Serna and Hannah Kelly took part in this challenge, with a brief to create an email that encourage new donors to donate over Christmas, as well as pass on the request or share their donations on social media. Voting will close on the 8th December and Winners will announced on the 11th December.